A SpaceX Falcon 9 rocket launches the U.S. Air Force's X-37B space plane on Sept. 7, 2017. SpaceX is planning to loft a secret payload called Zuma for the U.S. government on Nov. 15, 2017. Update for Nov. 15: SpaceX has delayed the launch of the Zuma mission 24 hours to Thursday, Nov. 16, between 8 p.m. EST and 10 p.m. EST (0100-0300 GMT). Full Story: SpaceX Delays Launch of Secret Zuma Mission to Thursday | Read our original mission preview below. SpaceX is getting ready to launch a secret satellite to orbit Wednesday night (Nov. 15). The spaceflight company test-fired one of its Falcon 9 rockets Saturday (Nov. 11) at Florida's Kennedy Space Center (KSC), to help pave the way for the planned Wednesday liftoff of a payload known as Zuma. 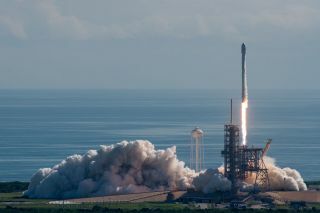 SpaceX will loft Zuma for the U.S. government, in a launch procured by aerospace and defense company Northrop Grumman. But we don't know much beyond that; it's unclear exactly what Zuma is, or what it will be doing. And we probably won't find out, either. "The Zuma payload is a restricted payload," Lon Rains, communications director of Northrop Grumman's space systems division, told Space.com via email. Rains did add, however, that Zuma is headed for low Earth orbit (LEO), which extends to about 1,240 miles (2,000 kilometers) above the planet. LEO's most famous resident is the International Space Station, which usually zooms around Earth at an altitude of about 250 miles (400 km), completing one lap every 90 minutes or so. Wednesday's launch is scheduled to occur from KSC's historic Launch Pad 39A — the former site of Apollo moon mission and space shuttle liftoffs — during a 2-hour window that opens at 8 p.m. EST (0100 GMT on Nov. 16). If all goes according to plan, less than 10 minutes after liftoff, the two-stage Falcon 9's first stage will come back to Earth for a vertical touchdown at Landing Zone 1, a SpaceX facility at Cape Canaveral Air Force Station, which is next door to KSC. These landings are part of SpaceX's effort to develop reusable rockets and spacecraft — technology that company founder and CEO Elon Musk has said will slash the cost of spaceflight.